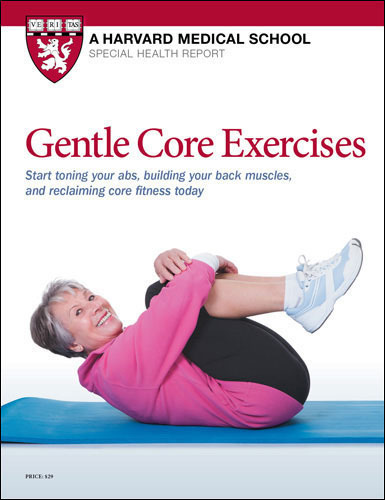 Gentle core exercises are specially designed for people who aren't up to tackling regular core exercises, perhaps because they are out of shape or possibly due to an injury or health problem. This Special Health Report, Gentle Core Exercises: Start toning your abs, building your back muscles, and reclaiming core fitness today, will show you how to build your core with workouts that are gentle and rewarding. You’ll be introduced to more than three dozen exercises designed to strengthen core muscles, increase flexibility and stability, improve balance, and tone your silhouette. In as little as fifteen minutes a day, you can build the core fitness that is essential for keeping you active and independent in the years ahead. Weak or inflexible core muscles can impair how well your arms and legs function. A strong core makes everyday tasks less difficult, wards off back pain, and keeps you ready for your favorite sports and pastimes. This Special Health Report will show you how to build your core with workouts that are gentle and rewarding. You’ll be introduced to more than three dozen exercises designed to strengthen core muscles, increase flexibility and stability, improve balance, and tone your silhouette. Prepared by master trainers, Gentle Core Exercises will give you maximal gain in minimal time. Moreover, you’ll learn how to perform these exercises — stretches, lifts, planks, and more — safely and efficiently. These are workouts that can be done anywhere and anytime. There’s no need for fancy clothes or pricey equipment (just a mat, a chair, and a ball). You can do the exercises at home or in your office. And our short workouts can be done in just 10 minutes for one set and 20 minutes for two. And they can be done by anyone! These workouts work for people of all ages and fitness levels. They are designed for you to progress at your own pace and tailor the program to your own needs. Beyond the core -- why exercise? How should core work fit into your overall exercise plans? What does the terminology in the instructions mean? How can you measure gains? A cure for “sitting disease”? “Sitting disease” is a not-quite-medical phrase that captures a list of ailments worsened by sedentary habits. Prolonged sitting—an apt description of modern work and home lives for many people—harms us in many ways, according to recent research. Extended sitting contributes to a worse ratio of good-to-bad cholesterol, slows the clearance of glucose (sugar) from the bloodstream, and reduces insulin sensitivity, all of which hike up your risks for heart disease, stroke, and type 2 diabetes. Waistlines widen, too, with implications reaching well beyond whether you can wriggle into your current wardrobe. A 2012 study of more than 220,000 Australian adults ages 45 or older found that the risk of a premature death from all causes increased with the amount of time subjects spent seated throughout the course of the day. Mortality rose 15% among participants who sat eight to 11 hours per day, and 40% among people who sat 11-plus hours per day, compared with those who sat less than four hours per day. Why does prolonged sitting have such negative health consequences? One explanation is that it relaxes your largest muscles. When muscles relax, they take up very little glucose from the blood, raising your risk of type 2 diabetes. In addition, the enzymes that break down blood fats (triglycerides) plummet, causing levels of the “good” cholesterol, HDL, to fall, too. The result? Higher risk of heart disease. Given the research, breaking up long blocks of sitting to flex your muscles seems like a wise move for all of us Take your phone calls standing up. Use a standing desk. Hold treadmill meetings or walking meetings. Sit on a stability ball to work or watch TV. Cut back on TV in favor of more brisk strolls or bike rides. And, yes, do core exercises. The following reviews have been left for this report. Log in and leave a review of your own. This is a brilliant little book. I especially appreciate the short series of standing core exercises designed to be done at the office as a break from sitting. I've discovered that I can do them just after getting up in the morning, and I love that. I avoid mat exercises for an hour or two after getting up because of a damaged disk that's sensitive in the morning, but these standing exercises are very gentle and don't bother my back. They give you an interesting break from sitting. You can do the exercises holding a chair with both hands, so even if your balance is not the best, you don't risk a fall.